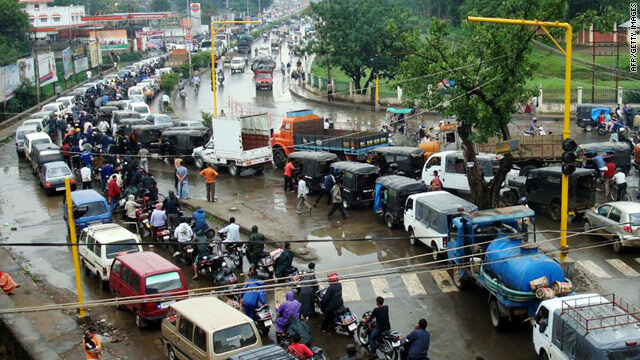 Vehicles in India's Manipur state line up for gas as a blockade caused supply shortages on Wednesday. New Delhi, India (CNN) -- A two-month blockade by ethnic tribes that stripped the luster from a "jeweled land" in a remote northeastern corner of India may be ending soon, a top Indian official said Friday. More than 2 million people were fast running out of food, fuel and life-saving drugs in Manipur state amid a blockade of vital roadways in place since mid-April. Protesters from the Naga Students Federation have promised to end the stalemate shortly, Home Secretary G.K. Pillai said. But "it may take a few days. We hope it will be lifted early next week," he said. For years, tribal groups in Manipur have resisted the authority of New Delhi, claiming that they have suffered neglect from the central government. Dissatisfaction, in turn, has given rise to an insurgency that has inflicted violence on the state. The Manipuri Nagas tribe wants greater autonomy for its districts and was unhappy with the state's decision to proceed with overdue local elections. Naga leaders boycotted the vote, claiming that their demands have not been met. Passions were also fueled last month when state authorities prevented Naga rebel leader Thuingaleng Muivah from entering his native village. The economic stranglehold of the highways, seen as the lifeline to the state, was also affecting emergency services in hospitals, officials said. "The situation is very serious. There's an acute shortage of foodgrains and medicines," said Manipur government spokesman N. Biren Singh. In Imphal, the state capital, residents are facing crippling shortages. Anju, a homemaker, said she had been using a kerosene stove for a month because cooking gas was not available. Luckily, she said, she had stockpiled kerosene but feared that the market had no more to offer. She also felt lucky that her family owns a rice field and isn't dependent on local stores, where shelves were emptying fast. Though blessed with the beauty of blue mountains and oval valleys, Manipur is landlocked. Authorities were flying in essential commodities, but Singh said air transportation of supplies was not enough to feed 2.5 million people. He said the state government was willing to hold talks with the protesters and put an end to the blockade. But some residents blasted the state government for rushing elections without addressing the core concerns of the local Nagas. "They should have talked with [the Nagas] and listened to their demands, right or wrong, before announcing elections," said Newmai Huniboi, a school principal in Manipur's Tamenglong district.